Turn heads and elevate expectations as you integrate your life with the radiant innovation and stunning design of the 2017 Toyota Corolla. Through its sleek four-door design you are given an impressive fuel economy and spacious seating for up to five. Available trim levels include the Corolla CE, Corolla LE, Corolla SE, and the Corolla LE ECO. 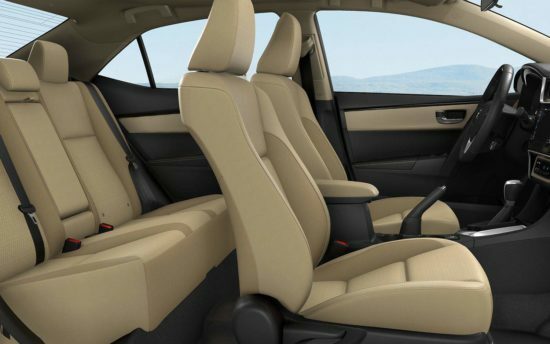 Mesmerizing design and modern functionality come together with the interior of the 2017 Toyota Corolla. Enjoy advanced features such as the Smart Key System with Keyless Entry and Push Button Start. This system allows you to access your vehicle and start your engine without taking your keys out of your pocket or purse. Refinement is evident with the soft touch console box lid, helping you to keep your belongings organized and secure. Escape the cold with the available heated front seats as you enjoy the added luxury of the available SoftTex Seat surfaces. Customize your seat to meet personal preferences through the 8-way power adjustable driver seat. 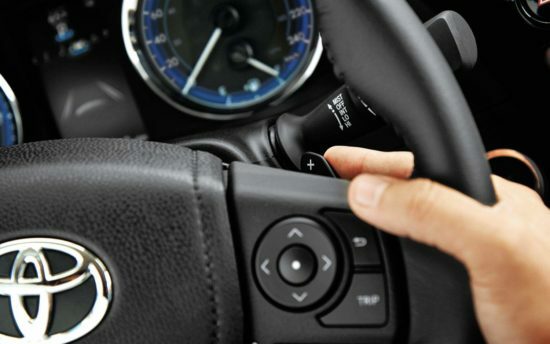 Also adjustable is the 3-spoke tilt & telescopic steering wheel, featuring mounted audio controls so that you can access your settings without removing your hands from the wheel. The steering wheel also comes leather-wrapped and heated, elevating your experience with smooth extravagance. Bring along cargo or passengers or both with the versatile 60/40 fold down rear seat as you make room for the needs of the moment. 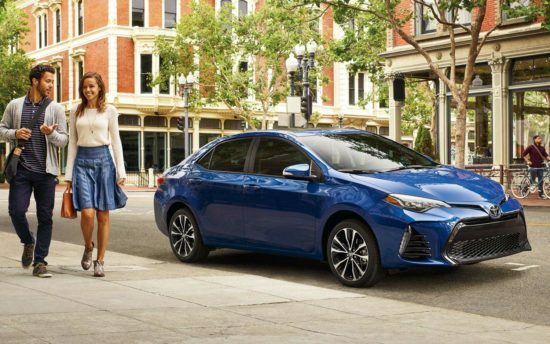 Encourage onlookers in the 2017 Toyota Corolla as you arrive in stylish functionality. Ensure in your ability to see and been seen in a variety of outside conditions thanks to the Bi-LED headlamps, Headlamp LED Daytime Running Lights, LED rear taillights. Aerodynamics are increased with the rear lip spoiler as you drive with an increased capability and swiftness. Attention to detail is revealed with features such as the chrome exhaust tip and sport front bumper and grille, bringing the design to the next level. Open up to the sky above with the power slide/tilt moonroof, where fresh air and natural light become welcomed companions. Modern connectivity is brought forward through the available Display Audio System. Featuring a dynamic 6.1-inch touchscreen with Voice Recognition and Bluetooth® Capability you are given many options for communication without distracting you from the road. Make calls, stream music and never miss a beat as you explore with the freedom of technology. Thanks to the available navigation system you are able to effortlessly arrive at each destination while you keep your eyes on the road. Enjoy a variety of listening options with the available SiriusXM Satellite Radio and over 120 commercial-free channels. Through the help of this streamlined technology, you are able to bring your world with you, no matter where you are going. Enjoy a personalized ride in the 2017 Toyota Corolla through a vast selection of available Toyota Genuine Parts & Accessories. You are able to drive up on 16-inch alloy wheels with available steel wheel covers as you protect your exterior with the addition of the illuminated door sill protectors, hood deflector or paint protection film. Combat chilly winter mornings with the help of a block heater as you experience life with an engine that starts even in jaw-dropping cold temperatures. Keep your interior looking fresh and new through the use of a cargo liner as you remain organized with the help of a cargo net. Enjoy a variety of additional features to help customize your vehicle into meets your specific requirements. Power and strength are yours in the 2017 Toyota Corolla, a vehicle that is able to deliver more torque at medium speeds and enhanced output at greater speeds, resulting in a holistic overall performance. 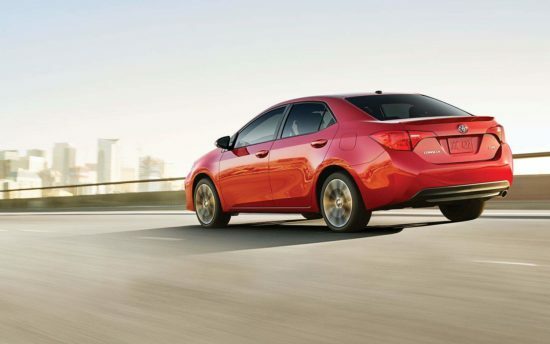 Efficient and responsive performance comes forward with the optional 6-speed manual transmission. Enjoy a peaceful ride as this transmission has been engineered for smooth and quiet shifting. Your driving dynamics are further enhanced with the help of the electric power steering, offering a smooth fluidity to each ride. Through its iconic and reliable design, the 2017 Toyota Corolla can present you with a relaxed and innovative driving experience. Take the long way home as you surround yourself with modern comforts and advanced communication, making every journey feel like home. Come check out the 2017 Toyota Corolla at your local Edmonton Toyota Dealer – Gateway Toyota as we show you want it means to be taken care of. Gateway Toyota has an extensive selection of new Toyota models to choose from for a test drive!